By March of 1914 the U.S. Navy had established a flying school at Pensacola, Florida. 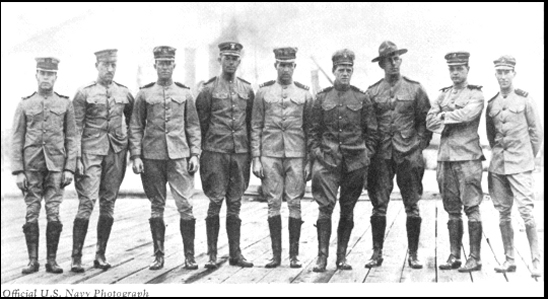 Among the commissioned officers taking the course that year were the above (left to right); Lieutenant V. D. Herbster, Lieutenant W. M. McIlvain, Lieutenant P. N. L. Bellinger, Lieutenant R. C. Saufley, Lieutenant J. H. Towers, Lieutenant Commander H. C. Mustin, Lieutenant (Army) B. L. Smith, Ensign de Chevalier, and Ensign M. L. Stolz. In 1935 the Navy inaugurated its Aviation Cadet training program. 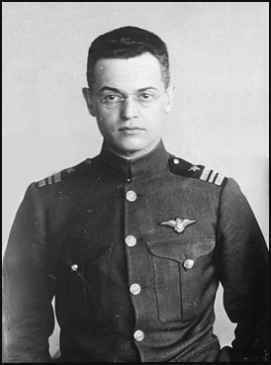 LCDR Godfrey Chevalier, who lost his life in an aircraft accident. Washington, D. C., May 8 -- Lieut. John H. Towers, head of the Naval Aviation Corps, with Ensign Godfrey de C. Chevalier as a passenger, made a remarkable flight from Washington to Annapolis today over an all-water course. The distance covered was approximately 169 miles and the actual flying time was three hours and five minutes, so that the machine was driven at an average speed of nearly fifty miles an hour. The flight was made in what is known as the flying boat, a product of the Curtiss factory, which was recently added to the equipment at the aviation camp at Annapolis. 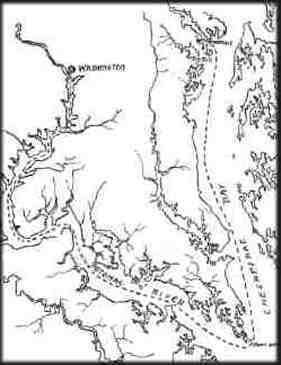 The course was from the Washington navy yard, down the Potomac river and up Chesapeake bay to the Naval Academy. The airmen maintained an average altitude of 1,700 feet. The craft ascended from the navy yard at 7:40 this morning, and it was 10:45 when it alighted on the aviation grounds at the Naval Academy. The flight was the longest continuous one that has been made by a service aviator in this type of craft. Lieut. Towers said to an AERO AND HYDRO correspondent, after the flight: "We bucked light head winds going down river and had a cross wind coming up the bay, rather puffing in spots. The flight was absolutely without accident, everything worked perfectly. The motor did not miss an explosion. We used our supplementary air all the way and flew with about two-thirds open throttle. Chevalier and I alternated in control. We started with 35 gallons of gasoline and 3 gallons of oil. We used 23.25 gallons of gasoline or 7.536 gallons per hour and used 1.625 gallons of oil, or 0.527 gallons per hour." ON THE FLIGHT DECK OF USS EISENHOWER (CVN 69)--Aviation Teddy Bear First Class Godfrey Chevalier flies with the "Nor’Easters of VR-62," a C-130 squadron from Naval Air Station, Brunswick, Maine. The Reserve squadron is in Sigonella, Italy, on a MED detachment. The bear belongs to Montclair Elementary School in Pensacola, Florida. With the help of the Navy, he is on a world tour sending information, photographs, and memorabilia back to the school for use in classroom lessons. He completed a WESTPAC tour in the spring and is spending his summer in Europe. Chevalier is assigned to COMFAIRMED until his return to Florida later this summer. 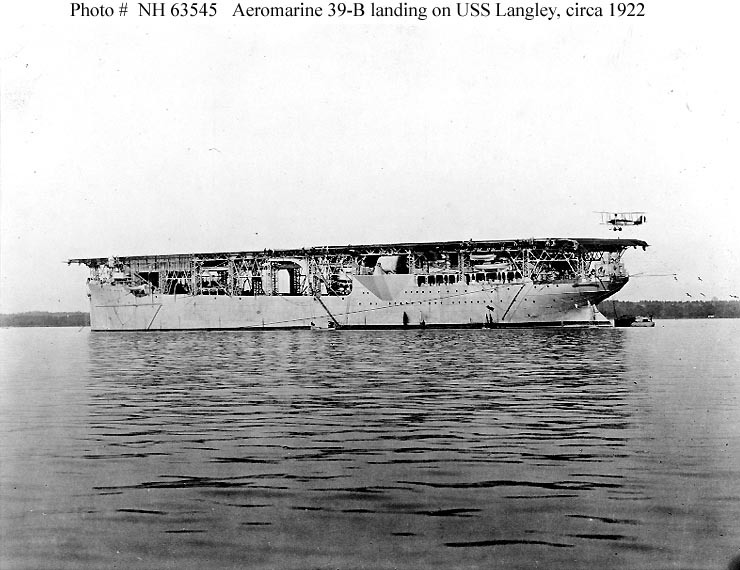 Aircraft Carrier Landing, Oct. 21, 1922. Photo courtesy of the U. S. Naval Historical Center. 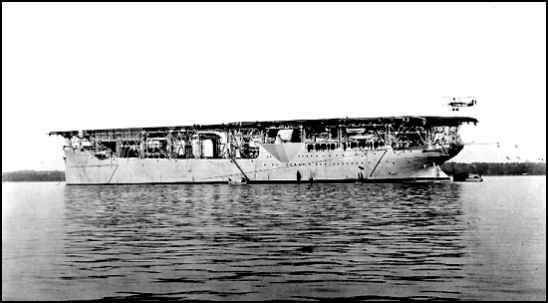 LtCdr Godfrey Chevalier made the first carrier landing in an Aeromarine 39-B on the USS Langley. His was one of many important events which were recently recounted on the occasion of the dedication of the Historical Marker which commemorates the Aviation Field Yorktown near the city of Newport News, VA. You can read the entire article by clicking on the title above.